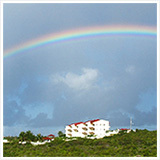 We've been coming to Anguilla since 2004 and like you, Nori, we like trying different villas. We rent from your favorite agent, Jackie. She's great. She greets us when we arrive, has some basic staples stocked in the kitchen so we can just put our feet up, have a snack that evening and then breakfast the next morning. 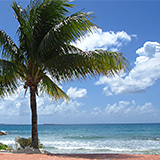 After breakfast, it's fun to do our full grocery shopping and load up for our stay in Anguilla. We love staying at villas!! A really special stay, though, was at Spyglass Villa. It overlooks Sandy Ground. The master bedroom is luxurious, with a king bed, huge bathroom and a deck from which you can see everything. In all, there are four bedrooms, a gym, even an entertainment area with a billiards table. I'd recommend this for either a large family, or 2 or 3 couples so you can occupy the entire villa. Nori's Reply: I am happy to hear of your wonderful experience with Jackie Pascher. She is so caring and always ensures that her guests are well taken care of! Spyglass Hill looks like a great choice. 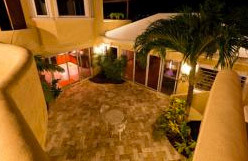 Spyglass Hill Villa (many call it Spyglass Villa, but the official name is Spyglass Hill Villa) is perched high on the Northern hill overlooking Sandy Ground beach. 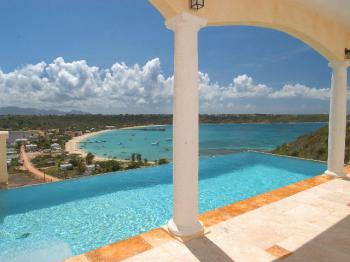 The villa features a large veranda (complete with infinity edge pool) that overlooks the beautiful beach. I have friends who live on the same hill as Spyglass Hill Villa. They say that when the sea is very clear, you can even see the silhouettes of large fish from the top of the hill! This Anguilla villa looks truly luxurious, complete with several amenities including air-conditioning, gym, plasma television, a full kitchen and BBQ. Service is five-star and raved about frequently. 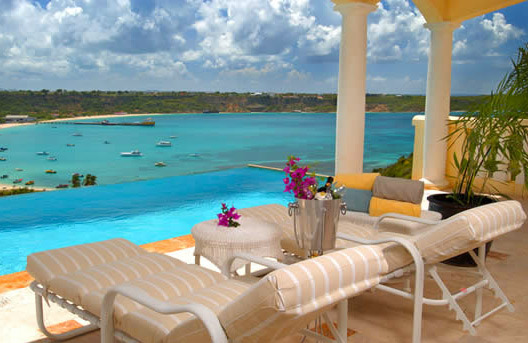 Other than the outdoor deck, what really catches my eye about this Anguilla villa? The charming courtyard at the villa's entrance, and inside - the villa's (glistening) bamboo floors. This villa was even featured on House Hunters International! It is certainly a one of a kind villa. Rates (for one bedroom) start at $600/night in the summer, and go up to $800/night in the winter season, making it one of the best Anguilla villa deals on the island. Sue, I couldn't agree more about Jackie, and about staying in villas (although my younger sister, Yuki, sure loved CuisinArt!). And Spyglass does indeed look magnificent. It sounds like a wonderful stay. Nori.